Mackie 2s brave the cold weather to run in 6 tries. Front Row: Andy Kelly, Mark Beadie, Mitch Smith, Finlay Stewart, Dan Malcolm, Dave Austin, Pete Smith. 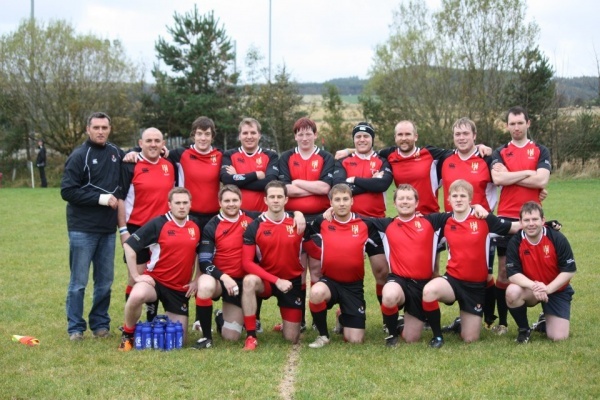 'The Mighty Twos' as they have become affectionately known are Mackie's 2nd XV. This is essentially the development team where our talented youngsters, experienced older players, players returning from injury and fringe 1st XV players all combine to create a team. For season 2014-15 'The Mighty Twos will be playing in BT Caledonia League Division 4 North. The Mighty Two's are the lifeblood of the 1st XV, without this team, Mackie would not be the club it is.